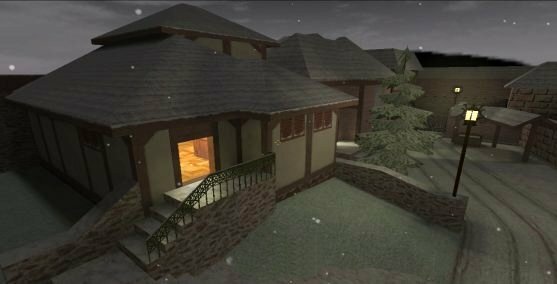 de_kalt was originally built to be a competitive map, but it didn't work out too well. Some problems in that respect are that it is too dark, the horse bombsite is too barren with not enough entrances/exits, and it has too many "fun" elements (like a door you have to shoot the panel off it before you can enter). 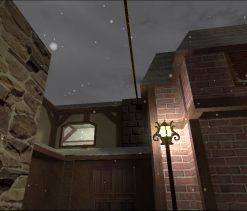 On the bright side, though, it sports beautful graphics with moving snow trees and a pretty snow dropping effect. There are lots of little things that make for assloads of fun sprinkled all over the map like a TV that plays a commercial (bikini girl included! 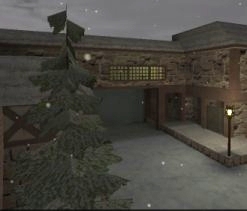 ), lots of secretive entrances and exits to rooms, trees to hide in, glass to break, and of course a tunnel to run in to when the bomb's about to blow. Overall, I heartily recommend this map for any and all public servers with players who just want to have a cataclysm of a good time.